Financial planners advise against putting capital to work by anticipating what might go up or down. Sachin P Mampatta and Krishna Kant report. 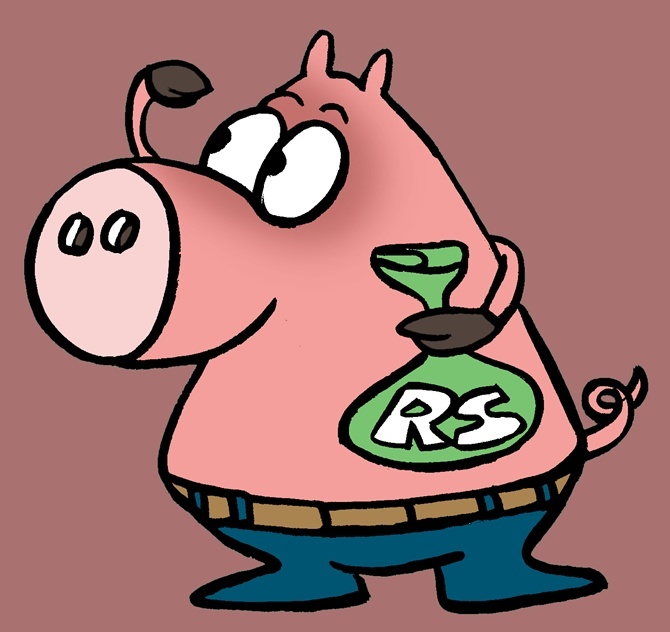 An investor who put his money into a fixed deposit would have outperformed most asset classes last year. 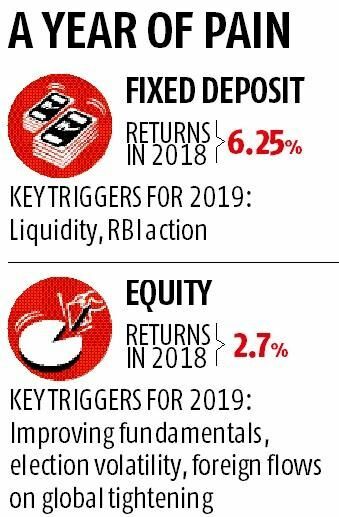 Equity, real estate, and even actively managed debt funds gave lower returns than the State Bank of India one-year fixed deposit returns in 2018. Gold gave marginally higher returns, but that too was in line with what many public sector and private sector banks offered. Experts say there is limited visibility on debt in 2019, while also pointing to uncertainty in other asset classes, with real estate under pressure on funding issues and equities being hostage to election volatility. Gold, though, may be a relative oasis of safety. 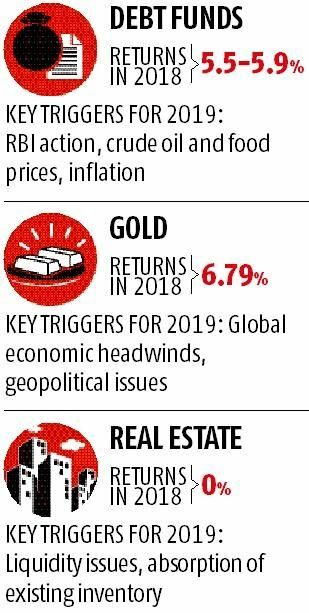 Chirag Mehta, senior fund manager - alternative investments, who handles gold schemes for Quantum Asset Management Company, says returns for the yellow metal are expected to be positive in light of economic headwinds globally. While sharp returns are not expected, it will end at a higher level than it is currently, he predicts. "Most of the gains will likely materialise in the second half of the year," he said. Most equity mutual funds did worse than the leading indices. For large-cap funds, one-year returns are slightly below zero, according to Value Research data, while mid-caps and small-cap funds have lost around 12% and 20%, respectively. Experts tracking equities point out that there is more hope on earnings, though elections can bring in a fair amount of volatility. V K Sharma, head of business, private client group at HDFC Securities, says that prospects for the markets are likely to only look up in light of improving fundamentals. HDFC Securities has a calendar year target of 12,400 points for the Nifty 50 index. A number of debt funds faced losses in 2018 because of their exposure to finance major Infrastructure Leasing and Financial Services. IL&FS, with over Rs 900 billion in outstanding debt, began to default on its obligations in September, catching off guard many funds that had invested in this highly rated institution. The outlook is not bullish for 2019, which has implications for real estate too. Ratings agency ICRA has said while there is stability in the commercial realty segment, the outlook for the residential real estate sector remains negative. The segment has been looking to non-banking financial companies to meet funding requirements. Many NBFCs have faced liquidity issues following the IL&FS crisis. This has affected real estate companies's funding costs and availability of capital in an environment of low demand from buyers. Real estate investors earned no capital returns in 2018 and almost the entire returns came of rental income. "Real estate prices remained unchanged during the current calendar except maybe in some micro market due to local factors," says Pooja Verma, assistant vice-president, Propequity. "Investors in residential real estate earned 1.5% to 3% rental yield on gross basis, while yields vary from four to seven per cent in commercial real estate, depending on location," adds Verma. It is better to create a sound asset allocation plan and stick to it through volatile periods to build wealth. "Don't chase returns, don't think you can predict the markets," said an expert.